We invite you to take part in talks by Prof. David Dreyfuß and Dr. Kirsten Heiß on autoantibody analysis with PEPperPRINT’s peptide microarrays and recent results of our SeroRA® library. 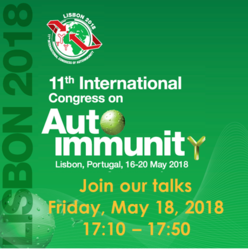 Prof. David Dreyfuß will give a talk about autoantibody analysis with PEPperPRINT’s peptide microarrays on Friday, May 18, 2018 at 17:10. "Proteomic analysis of virokines and other genes shared between Epstein-Barr virus and the human immune response"
"Biomarker discovery for the serological diagnosis of ACPA/RF-negative early rheumatoid arthritis using high density peptide microarrays with posttranslational modifications"
And don’t forget to stop by our booth #39. Visit our other colleague Gregor Jainta and discuss your autoimmune projects with us!